The following blog post was written in September 2012, so may be out of date in places. Originally published here. Over the past few months I’ve continued working on augeasproviders, a Puppet module that implements a few providers which use the Augeas configuration API to modify files. One of the interesting challenges has been testing providers, which I’m going to explain in this entry. The resource is added to a Puppet catalog instance and the catalog, containing a single resource is applied using Puppet. This tests the provider in a near “real life” setting, as all normal provider functionality will be used. A second catalog run is now performed in order to catch idempotency problems, which shouldn’t produce any further changes. If a getter and setter aren’t consistent, then Puppet will attempt to set a property on every run since the two implementations differ. This useful test discovered a few issues in augeasproviders. Unfortunately it’s a very verbose way of testing. Improving on this was to use the augparse utility shipped with Augeas, normally used for testing lenses transform between a sample file and a given tree. 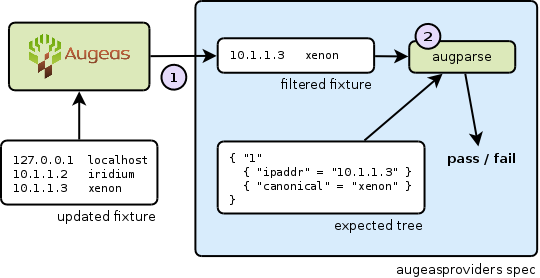 The spec was changed to generate a module for augparse that took the fixture and an “expected tree” in the spec and compared the two via the lens. Update: the new idempotency code and all the fixes it’s helped with have now been released as version 0.3.0.